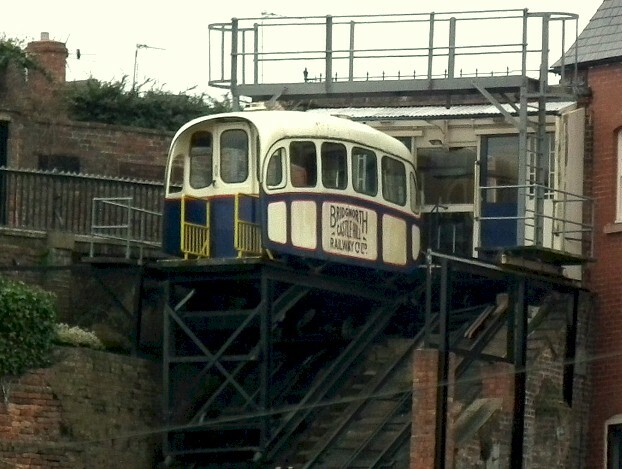 This is the Bridgnorth funicular, or as they describe it on their website, the cliff railway. It is said to be the steepest in the country and, although there are others, it is something of a rarity. It is one of the reasons I love visiting towns across the UK – they all have something different and unusual. Until recently, there was a fear that all high streets were going to look the same. The corporate owned chain stores with their large plastic hoardings and massive plate-glass frontage rendered many shopping centres identical. This reduced the pleasure of exploring towns and seeking out the individual shops and independent businesses. I, for one, do not regret that many of the larger familiar chains have closed or gone out-of-town and new, smaller businesses can flourish in their place. A Market town is traditionally where people met, traded and discussed the matters that concerned them. Live stock, produce and crafts were exhibited, bartered and sold. The architecture reflected the success of this in the layout of their streets. The way we interact when we buy and sell may have changed nowadays, but the history is still, thankfully, all around. Relics of the past that tell the story of who are, how we got here and what is important to us, lie scattered around for all to see. In my new episodes of the Bald Explorer, I want to take you around the country and show you this wonderful way of life, visit fascinating market towns and point out the hidden heritage that is right under our noses. It is all too often taken for granted. This is where the Kickstarter funding comes in. Because I have, so far, been unable to tempt the major TV stations to take my programme on, I need to find other ways to raise the capital to produce these programmes. In the past, as you know, I have asked favours of friends and even borrowed my children to help me to make the episodes. In order to make more of them, I really do need to start paying my camera crew, contributors as well as myself (we all have rent or mortgages to pay). Sadly, because the Community Channel, who have broadcast the episodes, are a not for profit organisation, they are unable to fund the programme directly. In every other way, they are extremely supportive, I hasten to add. The Kickstarter project is designed to see if it is possible to fund just one programme initially. It it works well, then perhaps, we can fund more episodes. I think it is a good thing to ask the public to get behind this project; if they like the idea, then we can make it happen. So, if you have enjoyed the series of programming I have produced and would like to see more, I urge you to support the Kickstarter project in any way you can.